Thugs and Bullies and Crass- OH MY! On the one hand, I think "That's Democracy" and applaud getting people to come express themselves about *Saving Ray Reynolds*. I actually love that type of thing happening and it's absolutely better than some despot filing a specious lawsuit full of falsity to try to get his way. The Citizens Center was quite full, and a lot of people went to the microphone during public comments to express their appreciation for Ray Reynolds. Some of those people had the mistaken impression that the hospital was on the agenda to be closed, or that ANYONE on the board wanted to close it (The power of lies, I suppose, to make people believe bullchit without any proof. There is NO board member that wants to close the hospital.) . And a lot of the people were really rude and derogatory towards my husband, as if they thought he called for this meeting instead of Chip Harrison, who actually did. I guess Chip didn't want anyone to know it was him, probably easier to have Paul be the scapegoat for all the wrath, including a quite vulgar gesture from Ann *How Classy* Best (she is apparently an office manager for Lakeside Physicians in Granbury. I'm guessing her employers, including CHS-Community Health Systems, have no problem with her representing their little corner of the healthcare industry this way or maybe they would encourage her to show up at Hood County's Lake Granbury Medical Center Hospital Board meetings and flip off those board members as a way to both express herself and represent their services). Update: I heard, anecdotally, that Ann Best no longer works for Lakeside Physicians from 3 different sources. I was appalled that Chip allowed personal attacks repeatedly on Paul, and never once said "Hey, it was ME that called the meeting. Knock it off" which says a lot about his own character. The following clip is edited with the start of Ann Best and her mom Mary Best's introduction, leaves out their comment and jumps, unedited to the end, to her vulgarity. 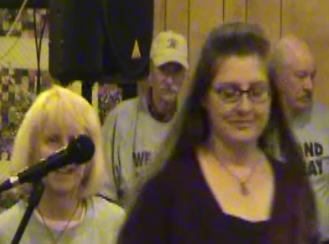 That is her father Darrell Best behind slightly to the right, laughing and beaming, must be so proud of his daughter. Someone asked me if it was possible that no one knew that she was flipping off the board, but you can easily tell by seeing and hearing that EVERYONE in the room knew what she was doing. Here's one more angle on this, from hospital district video after request, clipped. I hadn't really thought about this, but there is Mary Best, the mother (married to Darrell Best), who I think still works for Luminant/Comanche Peak/Energy Future Holdings in the Luminant building downtown, who went up with her daughter to the mike. When Ann starts the vulgar gesture, Mary's arm went around her and is rubbing her back in support. Did they plan this beforehand and thought this was a good idea???? Let me go further. The aura of the meeting was NOT a professional government meeting in which, as a democracy, respect is shown for others even when you don't share the same viewpoint, but rather a church revival meeting. Many are the ones that stepped forward to say they were praying for people on the board, praying for certain one(s) in particular and even one doctor that directed a spiteful sounding scripture at my husband. Although there was a lot of pious talk, I didn't hear ONE person step up as a Christian to say that doing personal attacks on ANYONE were unacceptable. I guess they were raised differently than I was as a southern baptist. 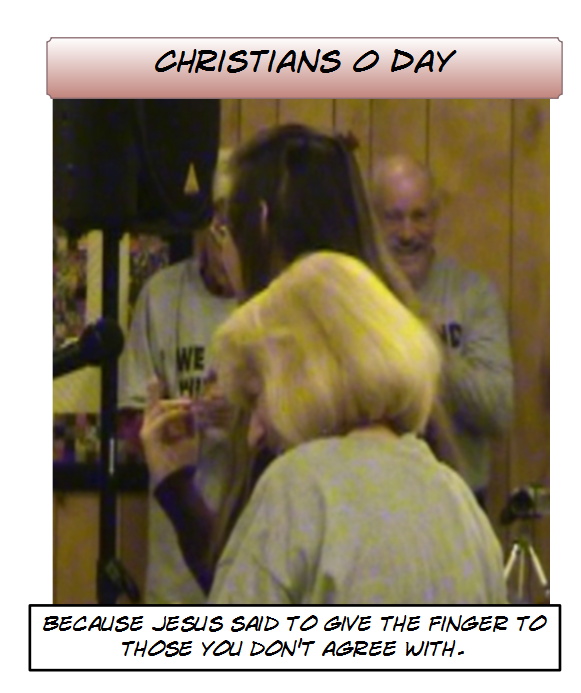 So I have to believe that when Ann Best thought it was great to give my husband the finger, with her mom and Darrell Best yucking it up in the background along with the crowd, that these "pious" people were laughing right along. Such a testimony to what kind of religion they belong to, and don't tell me it's the kind that says "Do unto others as you would have them do unto you" unless you approve of vulgar motions at ANYONE. If that's what brand of christianity is advertising, then only bullies and mean spirited people will join up. And, if Jesus was listening to those prayers, what about the prayer of THIS doctor who was concerned about patient health and safety and Ray Reynolds did NOT listen, nor did at least one board member who was going to be too busy fighting the other board members to help.. Did Jesus say "Oh, I"m only listening to the bullies at this meeting, sorry, you'll have to be a lot more derogatory and target the innocent for me to listen to YOU, doctor". What hypocrisy. As always the Glen Rose Medical Center hospital people and support group continued their disrespect for public meetings by clapping, cheering, yelling out. I guess they mistook that they were at a pep rally. I see this type of thing as not only not showing decorum but being intimidating to anyone who DOESN'T share that view. What, would this crowd have BOOED if someone HAD stood up to say an opinion other than a blanket "We Like Ray" view? If there *were* any hospital employees who didn't agree, reasonable to think they WOULD have spoken up in that environment? Maybe they would have been afraid that they, exposed, would be fired by Ray Reynolds at the first opportunity as retribution? Do none of them consider that acting that way makes some wonder about their own professionalism INSIDE the Glen Rose Medical Center hospital? It's just really weird to me that these are the ONLY government meetings where the people act like animals, but it's also laid at the feet of Chip Harrison, who can't seem to maintain control and has had 8 months to figure it out. Joan Taylor attended and decided this was a good time to insult members of the ELECTED hospital board. Not only did she throw some personal attacks at some of them, but also said people should plan to live here forever. She is another that apparently forgets that we live in America under an election system of government. Allen Sumners was taking around a jar to pay for an ad in the newspaper, before the meeting. Strikes me that a place, even the citizens center, where someone is having a goverment meeting, is an inappropriate place to go hawking for moolah, unless it's outside.Maybe we all should bring jars to all government meetings for our own personal projects-after all, aren't the people who show up to government meetings just sitting ducks waiting to be hit up for money? One woman brought up Paul's heart attack. Bad enough that that was used by Andrew Lucas in Darrell Best's civil lawsuit against Harper, because presumably there's nothing that Darrell Best will not do or sink how low, but, in this case, something personal said by someone that does not even KNOW my husband. I suppose if he had died of another heart attack on the platform after being personally attacked almost continuously for no cause that this mob would have come up and danced on his dead body. (There is a certain irony, here, eh? Health care workers???) Another man thought it was just fine to threaten the board by indicating he had been looking up their assets in preparation to suing them, and he knew all their net worths. Again, the first moment that someone decided to, stalkishly, threaten a board member, Harrison should have gaveled that person down and if he didn't stop, had him removed. A few people griped about the board and how they have issues. DO THEY NOT KNOW that ONE of the board members has repeatedly verbally attacked Paul Harper with slurs, innuendos, etc and at least one board member, MAYBE THE SAME ONE, has said he would be too busy fighting the others to help with patient safety issues? Sheesh. If there's a problem with the board, shouldn't that one at least ATTEMPT to not inflame the issues by acting like a jerk so often? 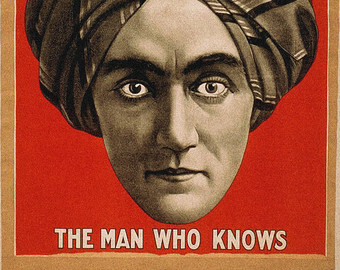 Incidentally, at least one person seemed to think that an ELECTED board was supposed to be a rubber stamp and Pay No Attention To That Man Behind The Curtain. Not so. Every single person that was on that dais was ELECTED, ALL had people that voted for them, not for necessarily the same reasons, but in the view of the anti-democracy boors that showed up the other night, ONLY THOSE that they agree with should have the right to be on the board, state opinions or be able to vote. Means the others don't have a voice, so why have a hospital district? Is it just to have a neutered rubber stamp board that will vote to raise taxes and not pay ANY attention to how the tax money is spent? One person said her interest in having people move here is for the hospital AND so that people can use the golf course. As we all know, the golf course is subsidized by the taxpayers, and if you aren't a golfer, such as me, you don't benefit. It's like Grifters that have moved on down that want the tap wide open and to take advantage of freebies at other's expense, without accountability. Well, I for one, don't agree, no matter how loud the mob shouts. And what about Darrell Best? Appeared to me that he was at least partly behind this effort. I mean, somebody arranged for an ad in the paper, for t-shirts, and to orchestrate people attending. Did he tell those people to please show some respect for the board by not personally attacking anyone, by not clapping and cheering, etc? This man wanted to be Somervell County Commissioner Judge, for gosh sakes, and has been himself an appointed official on a city board. 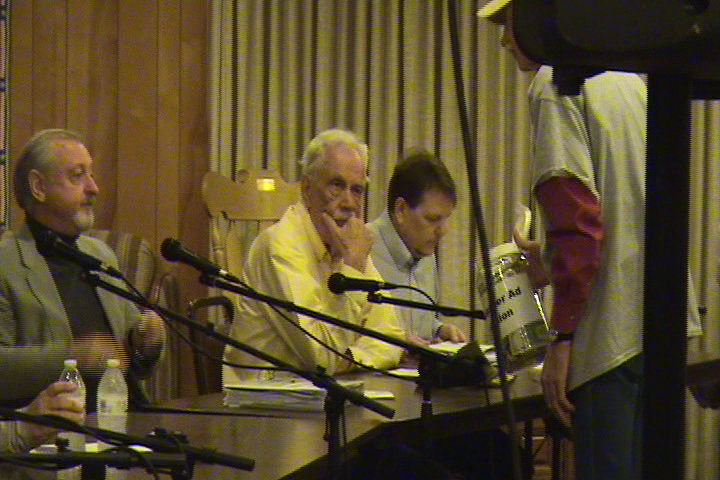 Imagine going to Commissioners Court or City of Glen Rose and seeing a rabid crowd like this at EVERY meeting. Or maybe he would actually maintain control IF it was his position to maintain but it's just fine to act badly for anyone else in government. He sure doesn't seem to like it when someone says something HE views as a personal attack, such as about this exchange about the Palace Theatre between him and Billy Huckaby. He took umbrage and asked Huckaby if he was calling him a liar. He sure also seems to like his daughter's vulgar free speech, but nothing wrong with SUING a government official if he or his wife exercise theirs, as well as making false accusations in that lawsuit. Trying to imagine his reaction if Billy Huckaby or a citizen in THAT audience had stood up and given HIM the finger? Much more fun, I'm sure, to heartily laugh as his daughter, standing with his WIFE (Ann's MOTHER), gives the finger to my husband. Honestly, what the heck does this say about HIS leadership? Not anyone I would EVER want to follow or vote for, but then that shouldn't be a surprise for any readers of this site, who know how I feel about such matters as the $80,000 Land of Dinosaur money given out with NO contract or money going from the 4b to the Chamber. Someone told me he actually got up while a hospital board executive session was going on to grab the mike and work the crowd-if that is true, does the man have NO SHAME??? No Political Opportunity Too Small that Can't Be Exploited, eh? How was that not thwarting the judge's order? That seems quite dishonest to me, and I am of course entitled to my opinion.Otherwise, he seems like a pleasant man. Pleasant isn't the same thing as accountable, competent or honest. Incidentally, this ought to lay to rest about the untrue, obnoxious *Paul Harper CONTROLS EVERYBODY* baloney. That includes Ron Hankins false accusation against Paul Harper last week where Hankins said he KNEW what the outcome of this vote was going to be. Seems like maybe Hankins needs to wash his magic swami hat since it's giving his brain bad signals. It is not the intention of the Caldwell County Commissioners Court to provide a public forum for the demeaning of any individual, group, County employee or member of the Court. Neither is it the intention of the Court to allow a Citizen speaker to insult the honesty and/or integrity of any county employee, other member of the public in attendance, nor any member of the Court, individually or collectively. Accordingly, profane, insulting, demeaning or threatening language directed towards the Court and/or any person in the Court's presence and/or racial/ethnic, or gender slurs or epithets will not be tolerated... Extensive clapping, shouting, or any other disruptive behaviour will not be tolerated in the Court. .
She proceeded to comment on how 'nasty' things were getting. She asked John if "fighting Ray" was worth it? That falls in line with what I have been told, privately, by a lot of people who are my friends; people that agree with me about how badly and undemocratically some board members and some in the crowd behave. Many are kin to others in town, through living here for years, intermarriage, etc, or have a business here and just do not want to speak out and rock the boat. Perhaps it's also that they don't want this technique of *shunning* to be publicly directed towards them. At any rate, it explains the weird, vitriolic behaviour of the crowd. Glen Rose Medical Center has some serious corruption issues. Are all the doctors being paid to keep a closed lip on all the issues that they once were expressing but now seem to have forgot. Are the four board members going to let 48 citizens' dramatic performance speak for the 8,658 citizens of this county and not do what they were voted in to office to do? You heard so many wonderful things about Ray Reynolds but what you didn't hear is from all the employees that would disagree because of the fear of losing their jobs. 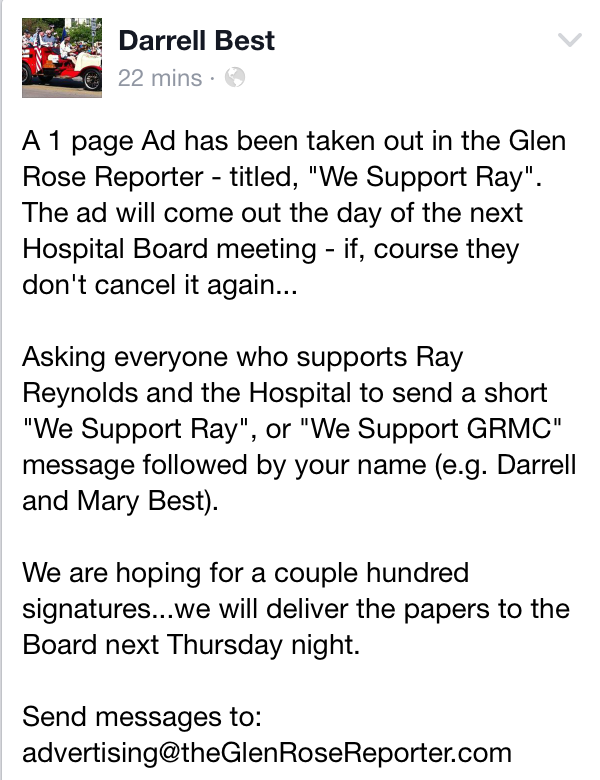 The citizens and employees of this county that are in support of Ray Reynolds are supporting out of lack of knowledge that really goes on behind the four walls of Glen Rose Medical Center. There are so many secrets it's concerning to think what is being covered up. The board should grow some balls, man up, and do the RIGHT THING! WE ARE SUPPORTERS OF THE PEOPLE, PATIENTS, AND HOSPITAL!!! By the way...what's with the newspaper "We support Ray" that has multiple names repeated...could they not get enough names to fill the page? @corruption13. Love your comment. I, like you, was really surprised that Chip Harrison, who called the dang meeting, STOPPED it AFTER the public comments but BEFORE the discussion of Ray which looked to me on the agenda would have included a review. Just because there's an orchestrated effort to bring in a lot of people doesn't mean that all share that view. For example, one person made a comment about how nobody there minded paying more taxes. Well, at least for me, I KNOW a lot of people, including people on fixed incomes, who DO and who voted against the district. There wasn't, to my knowledge, any concerted effort to bring in people of an opposing viewpoint.Anyway, if the people who were there don't hear the other side(s) of issues dealing with corruption, how the heck WILL they find out? Way to go corruption. This is ridiculous. The hospital board should follow what they promised the citizens of this county. This should not be allowed to happen. I guess this hospital board is just like any other elected person in our government, say whatever you need to in order to get elected, then bend and sway when someone crys. The tax payers are footing the bill for the hospital administration to take extra vacations, managers coming to work and clocking in and then leaving. uneducated administration spending the tax payers money and not being accoountable. The board needs to get rid of the administration and start over. That is the only way the hospital will ever get better. There is no telling how much corruption is going on behind those walls on the taxpayer dime. DO YOUR JOB BOARD!!!!!!!! @givemeabreak. It was Chip Harrison's meeting, because he had specific complaints against Ray Reynolds. (I know this because he told me personally and he also said that he had been down at the Citizens Center at that time of that first rescheduled meeting and told those people that too). It isn't "this hospital board*, it is WHY didn't Chip Harrison, who WANTED THE MEETING, follow through to at least allow for discussion which might have enlightened that mob? What happened with Chip and that doctor he said, in that letter I got through an open records request, he was going to help because the doctor was concerned with safety issues? Guess he threw that doctor under the bus. If he really believed that that doctor was right, and the safety of the hospital was at risk, why wasn't that brought up by Chip last night? Chip told me once that Ray wanted to get him down to sign for a huge loan that had NOT been voted on and approved by the board, and had never gone out for an RFP, etc. When I heard that, I thought, wow, are there OTHER things that Ray just *does* with taxpayer money that is out of the public eye? Course I have no idea what things Harrison thought were important enough for him to call this meeting, but whatever they were, I guess he didn't want anyone to discuss it in front of the people that probably most of all needed to hear it. For me, because I've been following the 501a for years, it's enough that Ray Reynolds said he didn't follow the contract in which he was supposed to have written reports showing how the doctors who got optional money had spent it. I filed a complaint about this LAST YEAR that both Sheriff Doyle and Andy Lucas saw, but apparently being an honest accountable administrator isn't as important as whether an admin comes by your hospital bed to say hello. I would have zero beef with this if this was a private hospital. I, like most people in town, want a hospital here. The questions about what services, what size, etc, are up for grabs, but not that people WANT care. Once something is a public hospital, the level of accountability should RISE and more scrutiny given to make sure the hospital is being a strict steward of taxpayer money. Seems like the people last night didn't care about that. the ones that spoke last night are either getting paid to work at the hospital in jobs that they are not educated to do, or like the doctors, ray signed contracts paying them big bucks so they have to back him. If this is a public hospital then why doesn't the public know what all of those uneducated, and lazy administration, doctors, and managers are making. Why aren't the salaries of all the employees posted or available to the tax payers who are footing the bill? The tax payers. Need to know. The board promised that the hospital would be held accountable. Fire Ray and get someone in there that knows how to do the job right. @givemeabreak.With you. That's how I feel as well. It appears to me that Ray Reynolds wants to run this as if it's a private hospital, and from my own experience with open records, makes it very difficult to find out information. I was told by Chip Harrison that Reynolds told him that he deliberately deletes emails so that they cannot be responsive to open records and that he deliberately waits 10 business days to respond rather than, as the Public Information Act says "promptly". I did manage, after some considerable difficulty, to get salary information for all employees, just haven't posted it yet. I was told the first time I did this, by Gary Marks, that even though GRMC would be public (before the FIRST hospital district election that ultimately failed and they came under the Commissioners Court) he would not have to provide salary information. I told him then and I was right, that yes, indeed he did, once you decide to go on the public taxpayer dole, your information becomes public OR you have to justify to the Attorney General why you shouldn't have to give it. I believe I recall seeing on a video of the district meetings that they voted to put the check registers on line. As of this moment, I don't see them. The Commissioners Court started putting their check registers online, as does the water district, some years ago. An posted agenda should be followed. Any deviation should be voted on by the board prior to deviation. This meeting called by president of the board and deviated by president of the board was confusing------what was he trying to accomplish? All board members remained quite while the pep rally was held. No business was handled. Why was meeting even called? The next meeting should strictly follow Roberts Rules of Order because "we the taxpayers" deserve more respect than what was given. What an insult! Nothing was accomplished. If our hospital district is run by an incompetent administration, we need to decide and make serious changes. This is for OUR community ! Don't set us up for lawsuits! @CC. With you.I would have liked to hear what the board members had to say and not just the people who showed up and mistook a government meeting for the circus. This is a disgrace. Ann Best had an opportunity to keep it classy, but instead just ended up looking like a fool. I am not impressed. Why are they trying so hard to silence Paul? Sounds like some corruption going on. It seems that perhaps they are at least trying to delay things until they can cover something up. That meeting looked like a high school cafeteria with a bully hivemind raging in there. Disgusting. Still, Ann Best is a small, small person. She should learn to actually use words. Using gestures is a uneducated persons game.